A father accompanies his daughter on a school field trip and spends the whole time Instagraming. College students literally choose an electric shock over sitting quietly for six minutes without any devices to entertain them. Children ask their parents to put down their devices and talk to them. Parents ask teenagers to put down their devices and talk to them. And a middle school calls in an MIT professor to find out why the 12 and 13-year olds are behaving like 7-year-olds, with underdeveloped social skills and an absence of empathy. The MIT professor they called was Sherry Turkle, who has studied the impact of social media on communication and relationships since the earliest days of the Internet. 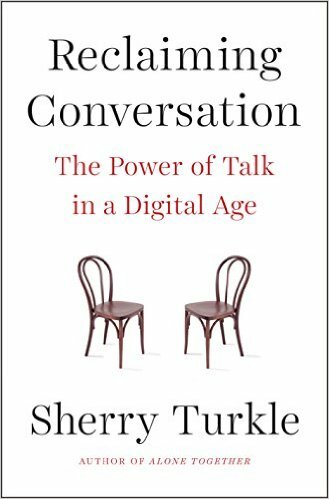 Turkle's new book, Reclaiming Conversation: The Power of Talk in a Digital Age has these stories and more examples of the way digital forms of communication have impaired our ability to connect at school, at home, and in the workplace. In an interview, she explained why in-person conversations with eye contact help us understand one another in ways that all of the email, texting, Snapchatting, re-tweeting, Vining, or clicking "like" on Facebook. You use the term "flattening the discussion" to describe communication via digital media. What does that mean? The body, the voice, the face, the eyes, the inflection - these are very rich communicators of states of mind. And when use them we develop a rich understanding of the state of mind of the person we are speaking with. And if you take all those things out you can absolutely have a transactional conversation, and sometimes it can be funny and kind of interesting. But you are flattening the conversation in the sense that you are taking out a lot of richness, depth, ambiguity, double meanings, ambivalence, the heart and soul of really what makes a person a person. They are feeling a lot of things at the same time which is the state of mind that people are always in. There's nothing wrong with digital communication but if you use it most of the time you end up flattening out the conversation. We are sort of cheating ourselves out of demeanor evidence about each other's state of mind and why, for no reason. Why does eye contact matter so much? Eye contact turns out to be one of the most powerful ways in which people not only communicate but establish a sense of empathic connection and establish a sense of the presence of the person they are speaking with. And when you take eye contact out you are losing that. We are aware of that when we for example go on Skype, where the only way to give the other person on Skype the feeling that you are looking at them, making eye contact, is for you to look at the camera. It's really disorienting and when you do that exercise you realize how much you miss just looking at someone's eyes. And the funny thing about "phubbing" is that it is a word that means making eye contact all the while that out of sight, like under a desk or under the table, you are texting. So it is a kind of simulation of what eye contact is supposed to mean, which is complete attention, when in reality your attention is split. It's kind of giving somebody the feeling of eye contact without the meaning of eye contact. What's wrong with not wanting to be bored? Well, there are several benefits to boredom. Boredom is your imagination calling to you to go within and to be creative and to find something within yourself to challenge you. To cut that off and to go to a screen really is to deny yourself that experience and you should not do it. And we find children rush into a screen instead of being able to use their imagination. They come in and they say, "I have nothing to do, I have nothing to say, I am bored, I want a film, I want a screen." If the capacity to be bored and the capacity to tolerate solitude is really one of the signal developments of childhood, you need that capacity for solitude. And maybe this is the most important point I make in Reclaiming Conversation -- you need that capacity for solitude in order to become a social creature because it is only when you can go within and know who you are that you can then be in a conversation and hear someone else and not project unto someone else what you need them to be saying but to really hear who they are. Some people look at my work and they say, "Okay, let's grant her that you shouldn't take out your phone when you are with other people, but who am I hurting if I take out my phone when I'm alone?" What you're hurting is yourself and your capacity to experience solitude enough to then be ready to be in a relationship. The two are very closely linked. What do we miss when our primary contact is through devices? There is an amazing statistic that there has been a 40 percent decline in all the ways we know how to measure empathy among college students in the past 20 years and most of it in the past 10 years. That's just an alarming number. And another fascinating experiment is that if you leave college students alone and just ask them to sit without a device and without a book for six minutes they will administer electric shocks to themselves rather than just sit quietly with their own thoughts. So there are two parallel developments: incapacity to emphasize and a lack of capacity for solitude. I think these things go together because both of them are what you would expect if from the very youngest stages we give people a screen to go to at the moment they feel the tiniest boredom. And that's what's happening. There are screens for baby bouncers. There are screens on potty trainers. There are robots that will read to your child instead of you sitting and talking to your child. So when I first got into this project I was asked to consult by a middle school. It was just a regular middle school and their teachers were saying that the students were not behaving for example the way 12-year olds should behave on the playground. They were behaving more like seven and eight year olds. That is to say they were being cruel to each other and excluding each other and didn't seem to be able to put themselves in the place of other children. They couldn't seem to be able to imagine what other children felt like which of course is the signal accomplishment of empathy. At first I thought it was kind of like a one-off thing but then the more I studied this the more I begun to see the crisis of empathy which extends not just for kids but really through late adolescence and I think into early adulthood. And conversation is the talking cure. After even five days at a sleepaway camp without devices children will start to recover a capacity to put themselves in the place of other children. So we are resilient, which is why Reclaiming Conversation is such a hopeful book. Some people are looking for techie solutions -- trying to create an "empathy app." But people are the empathy app. We are the empathy app.